Just wanted to send you a quick note to tell you how much I love your jigs. 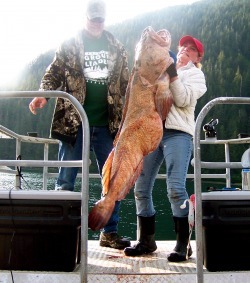 I’ve caught just about every salt water fish we have here in Alaska on your jigs. I have been fortunate to have two once in a lifetime days fishing over the years and both of them included your jigs. One of them was on the day this picture was taken. The 130 lb. 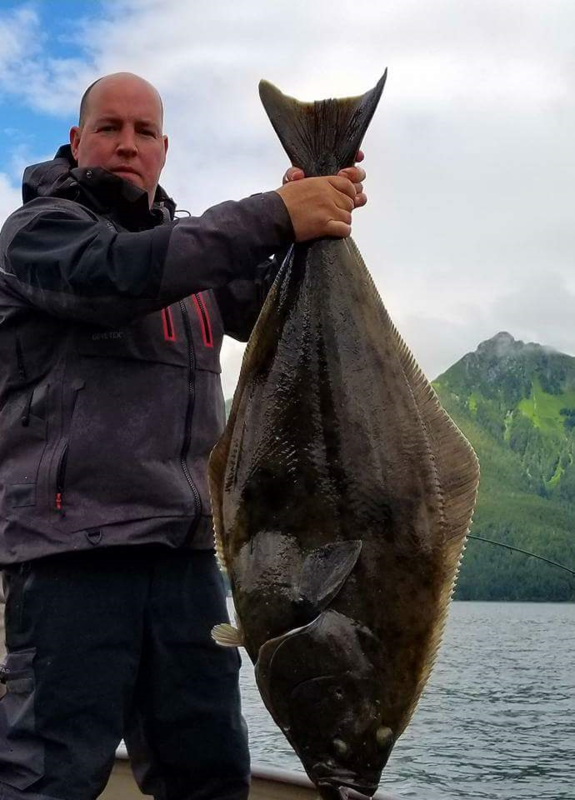 halibut in the rack was caught on one of your blue/silver 6 oz. jigs. This YouTube link: https://www.youtube.com/watch?v=YGeyBEgdMyk is the video of my catch and is has been viewed almost 1,400,000 times. 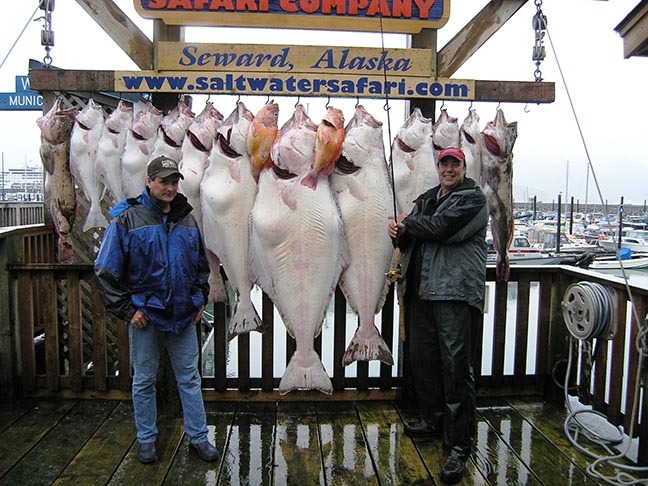 On this day I limited out on halibut, silver salmon, yellow-eye and black rock fish. All caught on the same jig. I just wanted to tell you that I love your jigs. I hope you enjoy seeing your jig in action and thanks for making a great product! 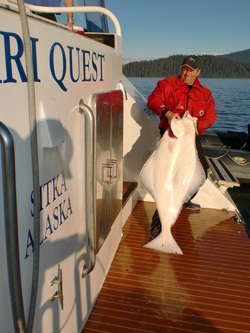 Jeff Weckel sent this photo of a halibut he caught on a 4oz pearl white dart. I just wanted to let you guys know that I recently ordered some of your new King Kandy lures and they are freaking awesome!!! First day on the water with a Green Chrome Candlefish on a hatchery king opener and we limited with ease....on my pole. The other pole had the standard setup for this fishery and didn't even get bumped. I must say though we were leery of the hook placement and ended up tying on our own leader with a swivel and a bead to get the hook to trail the lure instead of being stuck inside. This may have not been necessary but we felt it increased our odds for solid hookups. It was fished 42" behind an "11 flasher. "I've used other jigs and nothing catches fish like a Point Wilson Dart"
Quote from the letter Edward Duitsman sent with the photos: "I have been using Darts all summer in Baja for excellent results! 2 oz Anchovies, I use them on a Shimano calcutta 400 that I can cast a mile with 30lb braid spiderwire and 10ft floro leader. I have caught Yellowtail, cabrilla, sheephead, Triggerfish, mexican Hogfish, Bass, tons of Dorado and many other Baja mystery fish. My fave is into schooling Dorado, I can out catch anyone. We just got in from another awesome trip. We were in thousands of dorado feeding on bait balls of anchovies. The dorado would not hit or take our live macks or the live big eyes They were set on the anchovies only. Only your Darts could fool and catch these Dorado. Just about everything eats anchovies so these only make good sense. We have been in schools of dorado that would not even take our cut squid! They only wanted anchovies, and the Darts worked for me all summer! I not only recomend the darts to anyone but I now will demand that anyone fishing on my trips have at least 10 per person." 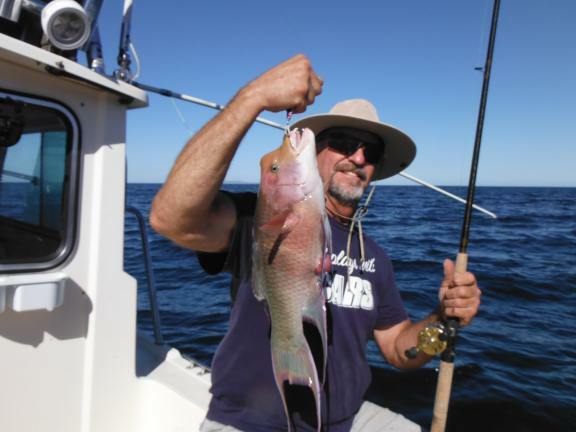 Mexican Hogfish on 2 oz dart. Photo sent by Edward Duitsman. 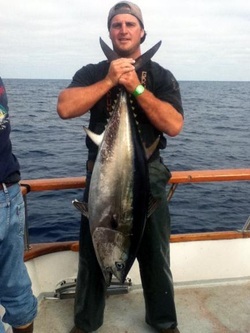 Maris Miller caught this 100 pound bluefin tuna on a 2 oz Point Wilson Dart. Another photo from Maris Miller. This one came with a story. 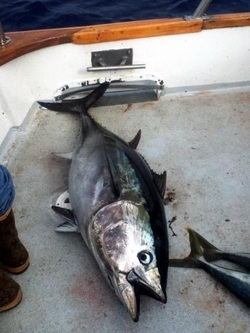 The tuna in this photo was caught with a Point Wilson Dart and the same rod as the tuna in the photo above - on a trip taken 15 years earlier. Ideal Cove Alaska lives up to its name. 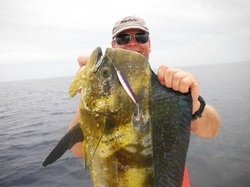 While on a cruise with American Safari Cruises, on the InnerSea Discoveries itinerary, John Beath went fishing by himself in a Kayak on a fine sunny day. 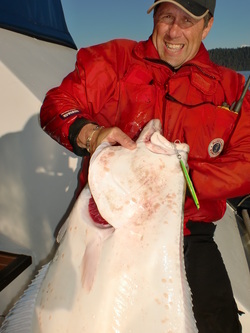 He caught this 60 pound halibut on a 3 1/2 oz green pearl Point Wilson Dart in 90 feet of water. We had a fabulous trip, your Point Wilson Darts were the highlight of fishing for Jim and I. I caught this lingcod and many other fish on the same dart before losing it. We are ordering more!!!!! I am a salmon guide on Kodiak Island. I use and lose your darts in my fishing operation. Yesterday we caught 30 Coho in one hour on the Point Wilson Darts. I caught 75 fish on one dart and finally lost it. I ordered some more. I had great success fishing with the pt wilson dart needlefish imitation last summer at winter harbour on vancouver island. I borrowed it from a friend who was hammering the fish like there was no tomorrow. The Point Wilson Dart was designed primarily for medium to deep water jigging for salmon and bottomfish. You can troll the lighter one ounce jigs but that was not the original intention. The jigs are made of lead, but I have caught salmon trolling them. I much prefer to vertical jig for salmon rather then troll for them. Especially if the fish are concentrated in one area. If I do have to troll (the fish are spread out and I can't jig) I always use a trailing hook (behind the tail) with whatever lure I'm using. It seems to catch more fish. This advice comes from an email written by the manufacturer.